A charming etching by Beauvarlet after the drawing by Greuse; published in Paris circa 1770. Jacques Beauvarlet (1731-1797) was an accomplished etcher and engraver who worked in Paris and was notable for his meticulous domestic studies. 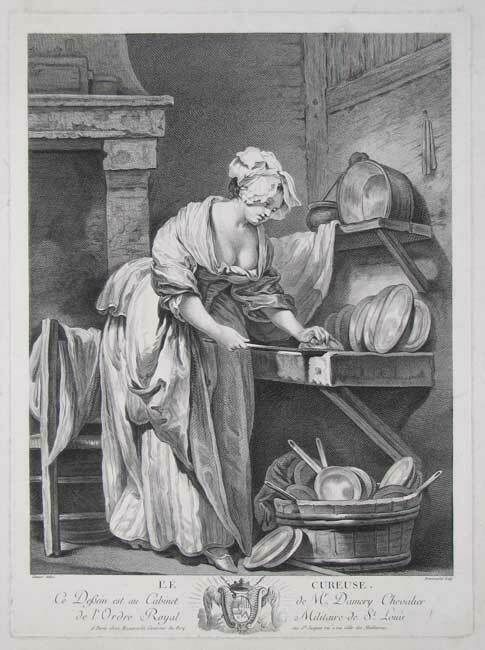 In this intimate and amusing scene from below stairs we see a comely kitchen maid (the translation describes her unfortunately as Scrubber) attending to her duties scouring the dishes and knives of her master. The attention given to her décolletage suggests that this image was intended for titillation but if we step aside from this for a moment we can also enjoy the wonderful array of pots, pans and plates of an C18th French kitchen. We see such paintings in Hogarth's magnificent satirical series Marriage à la Mode when the merchant's daughter brings her poor taste into the aristocratic home of the Earl's son and hangs the drawing room with art in dubious taste.